A morganatic marriage is a type of marriage which can be contracted in certain countries, usually between persons of unequal social rank, which prevents the passage of the husband's titles and privileges to the wife and any children born of the marriage. Historically, in Germany, the marriage is between a male from a royal or reigning house, and a woman of lesser status, being non-royal or within a non-reigning house. Sometimes the woman has a profession traditionally considered lower-status. Although various rights do not pass to her or the children, the children are considered legitimate and the prohibition of bigamy applies. Morganatic marriage results from the incompatibility that arises when royalty, or aristocracy, who are generally expected to follow the standards expected of them as public figures in all aspects of their life including choosing an appropriate marriage partner, and the personal desire to marry someone with whom they share romantic love. When these two are not in harmony, morganatic marriage became the solution. Institutions such as morganatic marriage reflect the unresolved confusion of humankind, and the need to develop clear standards that allow each individual to achieve personal happiness while also serving society as a whole. Morganatic, not used in English until 1727, is derived from the medieval Latin morganaticus from the Late Latin phrase matrimonium ad morganaticam and refers to the gift given by the groom to the bride on the morning after the wedding, the Morning gift or dower. The Latin term was applied to a Germanic custom (compare Early English morgengifu and German Morgengabe) where Morgen means "morning." The practice may also be called "left-handed marriage," because in the wedding ceremony the groom held his bride's right hand with his left hand instead of his right. Marriage is an institution both spiritual and legal, as well as a reflection of a natural coupling and nexus of identity for people within their family. Most cultures have very particular norms to guide how people marry and whom, and these families become the cornerstone for their societies. Monarchy and aristocracy, or nobility, have received privilege for their titles, and in return they were expected to perform various duties for their public. This is expressed in the phrase "Noblesse Oblige." One of these duties was to live in marriages of state, taken on often for the good of the nation, not for the benefit of the individual. As culture developed and individuals had more self-determination and wealth, gradually the idea of "romantic" love as the basis for marriage came about. Through this, common people had something the monarchy did not—romance. When royalty began to arrange morganatic marriages more or less on their own, it required a paradigm shift. In many cases, this was done easily. However, it is interesting to note that morganatic marriages are at the heart of some of the twentieth centuries greatest historical shifts—the beginning of World War I, the demise of Czarist Russia and with it the onset of the Soviet empire are significant examples. The former British Empire, upon which "the sun never set," has also seen much morganatic drama in the twentieth century. Social scientists have suggested that our contemporary "aristocracy" are actually the celebrity and the wealthy. If this is so, then perhaps prenuptial agreements provide for a modern form of the morganatic marriage. The practice of a bride price was noted by the Roman historian Tacitus in his observations of the barbarian Germanic tribes. Also called a "morning gift," it was a customary property arrangement in medieval German cultures (such as Langobards) and the church drove its adoption into other countries in order to improve the wife's security by this "additional" benefit. The bride received a settled property from the bridegroom's clan—it was intended to ensure her livelihood in widowhood, and it was to be kept separate as the wife's discrete possession. However, when a marriage contract was made wherein the bride and the children of the marriage would not receive anything other than the dower from the bridegroom or from his inheritance or clan, that sort of marriage was dubbed a "marriage with only the dower and no other inheritance,"—matrimonium ad morganaticum. The practice of morganatic marriage was most common in the German-speaking parts of Europe, where equality of birth between the spouses was considered an important principle among the reigning houses and high nobility. The German name was Ehe zur linken Hand (marriage by the left hand) and the husband gave his left hand during the wedding ceremony instead of the right. Although most common for the man to be the aristocrat, one notable exception was Marie Louise, Duchess of Parma. She was by birth an Archduchess of the Imperial House of Habsburg. Her first marriage was as an Empress of France with Napoleon I. She contracted a morganatic second marriage with a count after the death of her first husband. Morganatic marriage is not, and has not been, possible in jurisdictions that do not allow for the required freedom with regard to the marriage contract, as it is an agreement containing that pre-emptive limitation to the inheritance and property rights of the wife and the children. There has never been morganatic marriage in France and morganatic marriage never existed in French laws. Equality of birth is not that important in France because antiquity of nobility in the male line requires only "cent ans de noblesse" (100 years in the male line) to become a Knight of Malta. In contrast, a German should have "quatre quartiers de noblesse" (all four grandparents being noble) for the same purpose. There is only one example of a French practice that is similar. They have had a "secret marriage." Such a marriage took place in private and was never officially announced (although it might be widely known), and thus the woman never publicly shared her husband's titles and rank. Louis XIV of France married Madame de Maintenon in this way. They had no children. In such cases, the concern is that the sovereign leave heirs, and in the secret marriage that he leave no children. The equivalent of morganatic marriage has been a problematic topic in the United Kingdom, compounded by the unwritten constitution. Some of the wives of Henry VIII were considered by Rome to be only mistresses. This was the beginning of the Church of England, where these marriages could be declared valid. The Royal Marriages Act of 1772 made it illegal for any member of the British royal family to marry without the permission of the King. A marriage contracted without the King’s consent might be lawful in the eyes of the Church, but the children born of it could not inherit any claim to the throne. This resulted in the official denial of the marriage of George, Prince of Wales and Mrs Fitzherbert, and the refusal of Queen Victoria to the marriage of the second Duke of Cambridge, whose morganatic wife, Sarah Louisa Fairbrother was refused the title of Duchess, but was received everywhere as "Mrs FitzGeorge." A different approach was used by Queen Caroline, who became Queen Consort in spite of vociferous protests from her estranged husband, King George IV. Upon her insistence of the title, he then introduced a parliamentary bill to divorce and strip her of her title. However, this failed in the face of opposition from the London mob. Accepting a lesser title is less problematic and has no legal barriers. This occurred in the instance of the decision made by the daughter of the Earl of Wessex. She requested to be known simply as Lady Louise Windsor rather the HRH Princess Louise of Wessex. It was acknowledged however that Lady Louise would be free to assume the higher (and correct) style and title upon reaching adulthood. A morganatic marriage was involved in the start of World War I. Archduke Franz Ferdinand of Austria married Countess Sophie Chotek von Chotkowa. The bride was made Princess (later Duchess) of Hohenberg by Franz Josef. 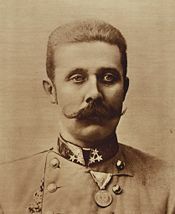 Archduke Franz Ferdinand, heir to the Austro-Hungarian throne, first met Sophie Chotek von Chotkova at a dance in Prague in 1888, and they fell in love. They kept their relationship secret for three years, before it became known to the Emperor. The Archduke knew that although Sophie came from a prominent Bohemian family, since she was not descending from the House of Hapsburg or from another ruling dynasty in Europe, she would not be an acceptable Empress. Emperor Franz Josef was against the marriage. Although Emperor Wilhelm II of Germany, Tsar Nicholas II of Russia, and Pope Leo XIII all tried to convince the Archduke that such a liaison would undermine the stability of the monarchy, Franz Ferdinand was adamant and they were married. The 1899 agreement was that the Archduke would be allowed to marry Sophie, but she would not be Empress and their children would take their mother's name and rank, and be excluded from the imperial succession. She also would not be allowed to accompany her husband in the royal carriage nor could she sit by his side in the royal box. The only family members permitted to attend the wedding were the stepmother of Franz Ferdinand and her two daughters. The couple had three children: Sophie (1901), Maximilian (1902), and Ernst (1904). In June of 1914, the Archduke and Sophie were invited to review the troops in the province of Bosnia and Herzegovina. This was a politically volatile time where large numbers of people living in Bosnia and Herzegovina were unhappy with Austrian rule and favored union with Serbia. Just before 10:00 on Sunday, June 28, 1914, the royal couple arrived in Sarajevo by train. They were escorted together in the second car of a six car procession, with the car's top rolled back to allow the crowds a good view of its occupants. When a bomb was hurled and many spectators and two escorting dignitaries were seriously wounded, the royal couple refused to part as requested by the security personnel. The subsequent assassination of the Archduke was the catalyst for the start of World War I. Grand Duke Michael Alexandrovich of Russia, the youngest son of Tsar Alexander III of Russia, married twice-divorced noblewoman Natalya Sergeyevna Wulfert (née Sheremetevskaya). They were married in Vienna in a Serbian Orthodox Church, not the official state church of Russia, the Russian Orthodox Church. The significance of this kind of ceremony was that the marriage could not be invalidated by Russian Imperial Courts or Russian Orthodox Church authorities. This was viewed as an act of cowardice and betrayal of duty by the Imperial family, especially as it was done while the Tsarevich was so close to dying making the issue of succession of paramount importance. Michael and his family were sent into exile, taking a tour of Europe before settling in England. In the fall of 1914, Grand Duke Michael requested permission to return to Russia to rejoin the army, which was fighting on the Eastern Front. This request was granted and he returned with his family, becoming a general and earning a cross of St. George, the highest military award. Nicholas II later created the title Countess Brasova, named after one of Michael's estate, for his mother. The son of Michael and Natalya, George, took his mother's name and rank, and was excluded from the imperial succession. Although he had been legitimatized, he and his descendants were excluded from the order of succession. However, when the Russian monarchy collapsed because of the Bolshevik Revolution, there was, and is today, some great debate involving that morganatic marriage and the right to the throne. On August 11, 1911, Nicholas II amended Article 188 of the Pauline Laws—to clarify that only equal ranks were allowed to pass title and inheritance. Yet, on March 15, 1917 he gave all titles and rule to his brother, Grand Duke Michael Alexandrovich in public. However, Grand Duke Michael declined to accept the throne, which then theoretically fell vacant, pending a decision on the next rightful heir. Czar Nicholas II was subsequently executed by the Bolsheviks who then created the non-monarchic, communist government in 1917. Although he had no succession rights due to the morganatic marriage of his parents, George was the last male-line descendant of Alexander III of Russia. The marriage of King Edward VIII and Wallis Simpson was not to be morganatic, although Edward had proposed this expediency to Prime Minister Stanley Baldwin, who rejected the idea after consultations with the governments of the Dominions. Ultimately, Edward renounced all of his titles for himself and successors when he abdicated, and was created Duke of Windsor. When they married, his wife became Duchess, and any male children would have inherited the title. The style H.R.H. (Her Royal Highness) is in the sovereign's gift, though it is normally conferred as a matter of course. However, it was specifically not granted to Wallis Simpson. As it happened, they had no children. Upon the engagement of Charles, Prince of Wales and Camilla Parker Bowles in February 2005, it was announced that, after the marriage, Mrs. Parker Bowles would take the title Her Royal Highness The Duchess of Cornwall, and that once the Prince acceded to the throne she would not be known as Queen Camilla but as Her Royal Highness The Princess Consort. This form of address is based on that used by Queen Victoria's husband, Prince Albert, who was the Prince Consort. This is similar to a morganatic marriage in that the wife did not take on her husband's rank and titles. However, the decision was not based upon Mrs. Parker Bowles's social rank, but upon her marital status. In fact, Camilla acquired her husband's full rank and titles through marriage, but chose not to style herself this way, due to the sensitivity regarding her role in the breakup of Prince Charles's first marriage to Diana, Princess of Wales). There is no legal reason why a Princess of Wales or a Queen Consort cannot choose to be known by a lesser style and title than she has. A similar instance is the decision that the daughter of the Earl of Wessex would be known simply as Lady Louise Windsor rather than the HRH Princess Louise of Wessex. It was acknowledged however that Lady Louise would be free to assume the higher (and correct) style and title upon reaching adulthood. In 1557, the Archduke Ferdinand II of Austria, Ruler of the Tirol married Philippine Welser, a bourgeois girl though very wealthy. Their children were given a separate title and the issue of Ferdinand's second (and equal) marriage were preferred. Charles Frederick, the future 1st Grand Duke of Baden and Prince-Elector of the Holy Roman Empire, the reigning prince of his state, married Louise Caroline Geyer von Geyersberg in 1787. This second marriage, after the death of his first consort Caroline Louise of Hesse-Darmstadt, followed a morganatic formula. At the wedding arrangements, she was created Freifrau von Hochberg. In 1796, the Holy Roman Emperor created her Heilige Römische Reichsgräfin von und zu Hochberg (HRE Countess of Hochberg, Illustrious Highness). Later, to achieve the objective of avoiding extinction, Grand Duke Charles I contracted an amendment to her marriage stipulations, relinquishing the Grand Duke from the morganatical limitation. In the same year, the diet of Baden decreed that Count Leopold of Hochberg (1790-1852) and his two younger brothers were in the line of succession to the Grand Duchy of Baden, as their mother's marriage was no longer limited to rights of only the Morgengabe estate of Hochberg. Louise of Hochberg was accorded the personal title "Princess of Baden," thus she did not become retroactively a dowager Grand Duchess of Baden. Upon the death of Louis I, Grand Duke of Baden, the first Grand Duke's younger and last surviving son of the first marriage, Leopold succeeded as fourth reigning Grand Duke of Baden. His descendants, originally from the morganatic marriage, held the grand duchy until the 1918 revolution, and remain its claimants. Emperor Alexander II of Russia darried Princess Ekaterina Mihailovna Dolgorukova in 1880. The Emperor did not designate this marriage as dynastically equal. They already had a few children. Their children received the title Prince Yurievsky and Princess Yurievskaya. One of their daughters married the Count of Merenberg and had a possibility to become consort Grand Duchess of Luxembourg, but her husband's morganatic birth ultimately prevented that. The Grand Duke Michael Mihailovich of Russia was the third child of Grand Duke Michael Nicolaievich of Russia and his wife Olga Fedorovna (born Princess Cecilie of Baden). He attracted the displeasure of the Tsar by marrying beneath his station in 1891. The Duke and Prince Alexander of Württemberg and Claudine Rhedey married in 1835. She was made Countess of Hohenstein; their children were later granted titles of Prince and Princess of Teck. The eldest son, Franz, was yet later created Duke of Teck. His daughter Mary of Teck married George V of the United Kingdom. Prince Alexander of Hesse and by Rhine, the son of the Grand Duke of Hesse and the Rhine, and Countess Julia von Hauke married in 1880. The bride was created Princess of Battenberg, and the resulting family provided a sovereign prince who became Alexander, ruler of Bulgaria and queen-consorts for Spain and Sweden as well as (through female descent) the current prince consort for the United Kingdom. Foster, Michael. The Succession to the Russian Throne and Morganatic Marriages Retrieved October 5, 2007. Taylor, A. J. P. 2001. English History, 1914-1945 (The Oxford History of England). Oxford University Press. ISBN 9780192801401. Velde, François. 2003. Morganatic and Secret Marriages in the French Royal Family Retrieved October 5, 2007.